The billboard then directs viewers to Nehlen’s campaign website, ElectNehlen.com. 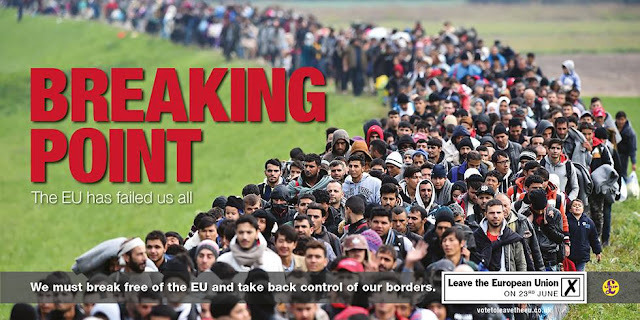 UKIP’s national billboard campaign is distinctive for its clear, straight-forward manner of describing the effects of large-scale migration and its impact on workers and Western culture. “This is the first of many billboards our campaign will be launching to inform the voters about what’s at stake on August 9th,” Nehlen told Breitbart. 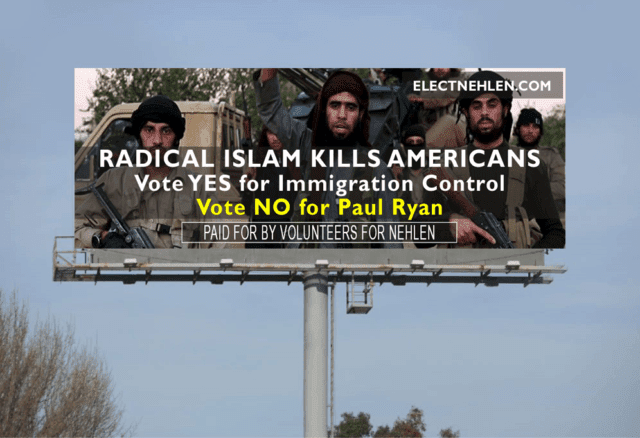 As Nehlen’s billboard suggests, Paul Ryan has a two-decade long history of pushing for open border immigration policies – including his 2015 effort to fund President Obama’s expansion to the U.S. refugee resettlement operation. The phrase “labor supply and demand can meet each other,” is a centerpiece of open borders thought. Under this global, one-world theory, any willing employer should be able to hire any willing worker regardless of what country he or she lives in. This view, that America is an “idea” and not a “nation,” sees borders as an obstacle to commerce. With regards to Islamic migration, Ryan’s controversial omnibus spending bill funded U.S. visas for nearly 300,000 (permanent and temporary) Muslim migrants in a single year. While polling data shows that the Republican electorate overwhelmingly backs proposals to temporarily pause Muslim migration, Ryan has rejected such proposals. However, Ryan has not explained how importing hundreds of thousands of migrants from nations that hold sentiments that are anti-women, anti-gay, anti-religious tolerance, and anti-America benefits the United States or helps to protect our Western values. Indeed, as a result of large-scale Muslim migration, the U.S. has imported several practices and values that are antithetical to Western principles. For instance, Muslim migration has put half a million U.S. girls and women at risk of suffering the barbaric and misogynistic practice of Female Genital Mutilation, according to Equality Now. A 2011 study by the Tahirih Justice Center titled, “Forced Marriage in Immigrant Communities in the United States” found that in the U.S. there are “as many as 3,000 known or suspected cases of [forced marriage],” identified by survey respondents in recent years. According to Pew, nearly all Muslims in Afghanistan (99 percent) support sharia law as official law. Between 2001 and 2014, the U.S. permanently resettled more than 40,000 migrants from Afghanistan on green cards. Additionally, between 2001 and 2014, the U.S. permanently resettled 674,920 migrants from nations where gays can be executed, according to data from the Department of Homeland Security (DHS). This figure does not include the total number of migrants the U.S. has permanently resettled from Muslim nations during that time, which is nearly 1.7 million. The current rate of U.S. immigration is record high. Every day the U.S. admits enough net immigrants to fill an overcrowded, metropolitan high school. Every month the U.S. imports a population of immigrants that is larger than the occupancy of Lambeau Field, where the Green Bay Packers play. Since Wisconsin voters sent Paul Ryan to Washington, the U.S. has imported a population of immigrants that is nearly three times larger than the entire population of Wisconsin. In seven years time – unless Congress takes action to curb U.S. visa distributions – the foreign-born share of the U.S. population will reach an all-time high. In the 1920s, the last time the foreign-born share of the population reached a record high, then-President Calvin Coolidge hit the pause button for roughly fifty years, producing an era of explosive wage growth and allowing immigrants already in the country to assimilate. Paul Ryan, however, has made clear that he does not wish to curb immigration, but instead has pushed legislation that would substantially increase immigration. According to Pew polling data, 92 percent of the GOP electorate — and 83 percent of the American electorate as a whole — is opposed to such an agenda and wants to see immigration levels frozen or reduced. Ryan represents only a minuscule seven percent of the GOP electorate that wants to increase migration rates. Read more at Breitbart.com; also visit PaulNehlen.com. GO NEHLEN! Let's get that Lyan Ryan OUT. He is a Uniparty, globalist, amnesty-loving supporter. A RINO of the first order. Get all the leadership OUT. McConnell especially. Come on Kentucky - do a recall if possible. Don't wait until McConnell's term is up - GET HIM OUT NOW. This is going to be an odd election year. I will vote for Nehlen. Not Ryan is a lefty panderer. Not sure how I can vote for Trump. I really believe Trump never intended to get this far. Now, it seems pretty obvious he's looking for a way to back out. I believe that Trump is in the race to give Killary the presidency. He is intentionally blowing it so she wins. He made a "deal" with BJ Bubba and will likely be "compensated" handsomely for playing his con game in front of the unwashed, ignorant masses.